Selected and produced by Marion Waite, Faculty of Health and Life Sciences, Oxford Brookes University. The objective of this resource is to introduce the concept of reflective practice within teaching and learning in higher education. Getting to grips with reflective practice can be troublesome and it is hoped that this resource is a useful starting point. If you are new to the concept of critical reflection the resource also aims to stimulate your curiosity and offer some concrete examples of how teachers in higher education use critical reflection as part of their every day practice. The influential work of Polyani (1958, 1967 cited in Bulman and Schutz, 2008) suggests that it is sometimes hard to put practical knowledge into words and advised the development of ways of helping practitioners to be able to develop effective critical skills in order to reflect upon their practice. The use of reflective cycles such as Kolb (1984) and Gibbs et al (1988) are examples of these developments, which you may already be familiar with. The essential role of reflection in these processes is to make sense of the observations of the effects of our practice, and use these reflections to continuously improve what we do. 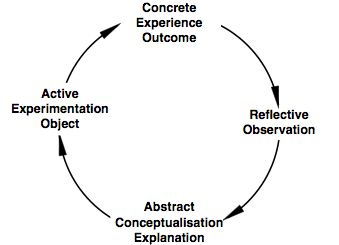 An additional framework for reflection within educational practice comes from the four critical lenses as identified by Stephen Brookfield (2005). These lenses will be briefly described and then three short digital stories will be presented from both experienced and aspiring lecturers to exemplify three of these critical lenses. For the fourth critical lens you are encouraged to go on a voyage of discovery of your own by reviewing the additional learning objects and links, which support this resource. Brookfield (2005) suggests two distinct purposes for reflection within teaching and learning. Firstly to reach a better understanding of how power underpins and distorts educational processes and secondly to question assumptions and practices that appear to make our lives look easier on the surface but in the long-term detract from our best interests. This is based on the assumption that if teachers are more reflective then they are better placed to make reliable judgments about approaches to teaching practice, evaluation, curriculum planning and purposeful responses to learners’ issues. “The critically reflective process happens when teachers discover and examine their assumptions by viewing their practice through four distinct, though interconnecting lenses’ (Brookfield, 2005 p xiii). In order to provide you with some concrete examples of how these lenses could be used to examine assumptions, there are short digital stories included in the pages for the first three lenses. The perspective which underpins this lens is based on the premise that our own experiences as learners can influence our behaviour as teachers. This may have a positive or negative impact but the important point is that an ability to use our autobiographical lens will enable us to identify these personal drivers and therefore review our practices. "I have been a teacher for more than 40 years, so reflective learning has always been on the cards and I am familiar with reflective learning cycles such as the Gibbs Reflective Cycle and the work of people like Donald Schon who is known for his insights into reflective learning. "I have also worked as a tutor on Oxford Brookes online Reflective Learning course with Peter Jackson and Jenny Moon, which was when I first put into words how I would define reflective learning and recorded this in this blog, which I created to accompany this course. "Blogging is a wonderful tool for reflective learning. I have been blogging fairly consistently since my first MOOC experience in 2008, in another blog which I call Jenny Connected. The title is related to a growing realisation that reflective learning can be enhanced through connection with others across the web. "Stephen Brookfield has written that autobiographical self-reflection is fraught with dangers. We all have blind spots in our work as teachers – practices and assumptions that we never investigate. "The openness of blogging and the possibility of encountering alternative perspectives is a way avoiding these blind spots. Even if not many people read my blog, or if I don’t get many comments on my blog, the very act of openly writing for an ‘invisible’ audience means that I have to reflect on what I think, what I do and why I think and act in the way I do. Through blogging I surface my tacit understanding and record it – and over time I will develop a history of blog posts that tell my individual learning story. "For me perhaps the best thing about blogging is that it is my own personal space. I am in control. I can choose to share or not to share my reflections, to be alone in a big open space or in the crowd in a similar space. And there are many people I can learn from in the 'blogosphere'." This is based on the premise that seeing ourselves through learners' eyes provides valid and reliable evidence for our practices as teachers and in particular how and what students are learning. In the following video you can quite literally see through the eyes of an undergraduate student in urban design at Oxford Brookes University. The innovative approach to capturing the lens of learners' eyes is the conception of Laura Novo de Azevedo who is senior lecturer in urban design at Oxford Brookes University. "The idea of involving students in using mobile lectures and producing videos that demonstrated their understanding of urban design principles was developed as part of the project 'The Power of Experience' (www.urbandesignexperience.com). The project originated from a concern with the fact that whilst urban design is about designing the 'real world' students were being taught in well insulated classrooms and perhaps not being able to transfer principles into practice. The collection of videos produced by first year undergraduate students in planning showed that students were not only able to understand and apply principles learnt in the classroom but that they could also add a critical evaluation of those principles reflecting on their experience of the place. "Because the production of a video is a very creative and flexible task students were able to use a variety of methods and techniques to communicate their ideas that brought an extra richness to the classroom discussions and helped us lecturers to engage with their learning preferences. This is based on the perspective that as teachers we need to feel credible in the eyes of learners. There can be a real fear about being found out as an imposter, many people may be able to identify with this, especially in the early days of being a lecturer. Brookfield (2005) suggests that by creating safe spaces where we can have critical conversations with our colleagues we may be enabled to ‘check', ‘reframe' and broaden our practices. In the following podcast you can hear a critical conversation between Clare Butler who holds a senior practice lectureship as a new lecturer in health and life sciences at Oxford Brookes University and Sue Schutz an experienced lecturer who works in the same department. Clare is using the lens of Sue's experience in order to create more effective online discussion forums within her teaching. The fourth and final lens refers to the place of the scholarly literature as a reliable mirror to hold up against our every day teaching practices. Brookfield (2005) suggests that the scholarly literature in relation to teaching and learning can make an effective substitute for a critical friend. We have included some further resources to exemplify this .This includes text based empirical evidence and theoretical perspectives. You are encouraged to go and explore these for yourself. It is hoped that you find all of these examples useful and that you feel motivated to read further about the Brookfield four critical lenses. You may wish to adapt the model or even create your own. As individuals you will have your own take on reflection and it is not suggested that the Brookfield model is in any way definitive. It is hoped that you feel enabled to share your perspectives on reflection. There is a discussion forum on reflective practice; please feel free to post your thoughts and any resources on reflective practice of your own. Brookfield, S. (2005) Becoming a Critically Reflective Teacher. San Francisco. Jossey Bass. Kolb, D. A. (1984) Experential Learning. Experience as a Source of Learning and Development. New Jersey. Prentice Hall. Poyani, M. (1967) The Tacit Dimension. New York. Doubleday In: Bulman, C & Schutz, S. (2008) Reflective Practice in Nursing. Oxford. Wiley-Blackwell. This is a selection from my search and certainly not exhaustive and I look forward to the additions, which you wish to contribute to this list. The following three profiles provide a good overview to three of the most influential thinkers in the arena of reflective practice. The following OER is an interactive guide to reflection. One of the interesting dimensions about reflective practice is the skill of teaching reflection to others. I find resources like this OER are excellent for introducing some basic principles. Please share your own resources on reflective practice on the discussion forum.